As you can tell, I LOVE puns! Don’t you love puns? They really make life punderful. 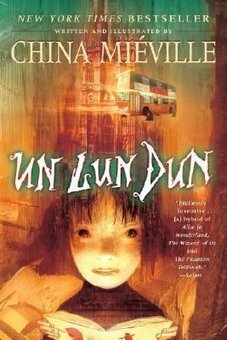 Un Lun Dun is a fantasy adventure about two London schoolgirls who find their way to an alternate version of the city that lies underground (UnLondon — get it?). This subterranean world is populated with ghosts, trash that’s come to life, a talking book that announces prophecies, and a colorful cast of characters — some friendlier than others, and some less friendly than they might seem. Can two girls from regular London save this fantastical world from an evil pollution being called the Smog? Obviously, I’m not going to tell you; you’ll just have to read the book to find out! And you REALLY REALLY REALLY should read this book. Not only is the story completely gripping, but as I mentioned, it’s also full of PUNS! Broken umbrellas as known as unbrellas. Black windows (ferocious windows with eight legs) guard Webminster Abbey. And, of course, there are ninja trash cans known as binjas. Of course. So if you love wordplay as much as I do (if that’s even possible), or if you just want an exciting read, then it’s time for a journey to Un Lun Dun! Ooh, yes, this is a good un! Lots of adventure and unexpected turns… makes you think about what’s under our city streets and what the whatevers might be doing! !